Dream the BIGGEST DREAM - is about each of us, as individuals, taking responsibility for our lives and doing what it takes to create the life we truly desire, for Ourselves and for Humanity. Part of what it takes, is to give ourselves the opportunity to identify what our own BIGGEST DREAM really is, for OURSELVES, for the Collective of Humanity, and for GAIA, and then to focus on creating (and attracting) that DREAM - and then to LIVE it! Only YOU can create your experience of reality - Here you will find tools that support your process. 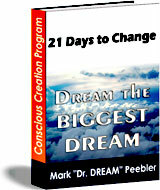 Dr. DREAM's Events, News, Views and Positive Energy, all relating to the Healthy Empowerment of One's Life ~ Sign Up Now!